It has been a while since my last post and since Cody had mentioned my feeling ill. I had a bad day, three days into the trip, and suffered from a fever and vomiting. Fortunately, I recovered the day after and have stayed healthy throughout the trip. I’m chalking it up to some strange reaction I had to motion sickness. Since then we have had rougher days and smoother days, but I’ve been well all the same. Actually, I’ve been better than well. I mean, I’m in out in the middle of the ocean, far from land, and no matter what direction I look in, I see blue water as far as the curve of the horizon. I’m literally floating above an entire world, full of mystery and life. That in itself seems wild and amazing, but truthfully, I’m more distracted by this incredible culture that surrounds me. I’ve been plucked from a stationary existence and dropped off in a fast-paced environment where being useful goes hand in hand with being experienced. Upon my arrival, I had absolutely zero experience with nut drivers, hose clamps, electrical tape, pear rings, shackles, and bowline knots, and even less with the incredible hardware and software of the instruments I have been strapping down and sending over the side of the ship into the cold depths below. I’ve used my hands for the first time in years, to actually build and bind and collect and disassemble. In the beginning, I didn’t know the names of the tools, or how to use them, but my determination to be useful combined with the opportunity to help has taught me a great deal in the past two weeks. Tim’s tripod and camera ready to be sent down. 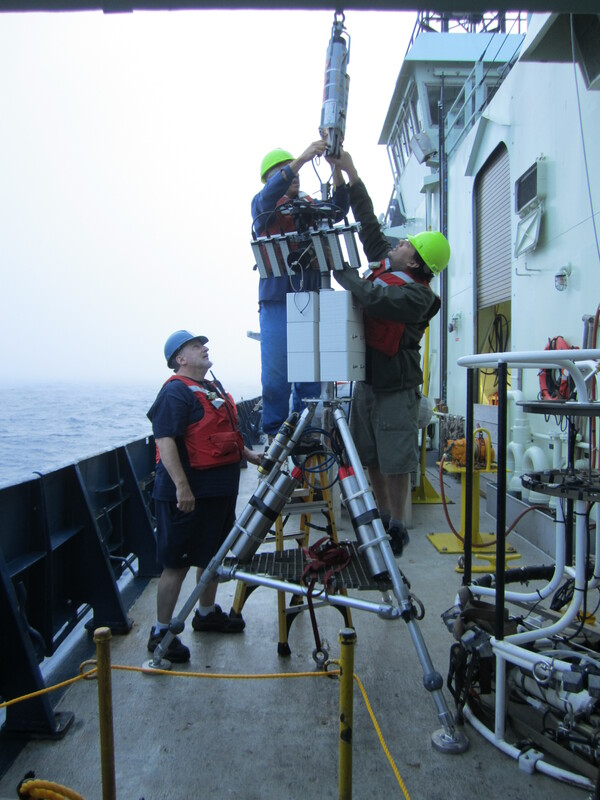 The mix of sailors and scientists makes for thorough entertainment. I’m consumed in countless stories from past decades and former jobs. When I really think of what it must be like to be a deck hand, or the Chief Scientist, or an engineer for the Alvin submersible, it’s like dreaming of an exotic life that I will never have as my own. Every detail, every memory in their lives, is unique and beautiful, yet foreign to me. I envy each of these people for their experiences, but more than that, I admire them. They have so much knowledge to share and I could easily listen for a lifetime. A few nights ago I was given an orientation and tour of the Alvin Submersible by Jefferson, an engineer, diver, and pilot in training. We walked around the exterior of the large submersible and he explained the purposes of the instrumentation and hardware. One of the most significant features of the sub is its ability to add or subtract weight so that it can become neutral in water. Large slabs of syntactic foam make up the bodice of Alvin, along with tanks that can be filled with air as needed. The syntactic foam is made of microscopic glass spheres making it positively buoyant in water. 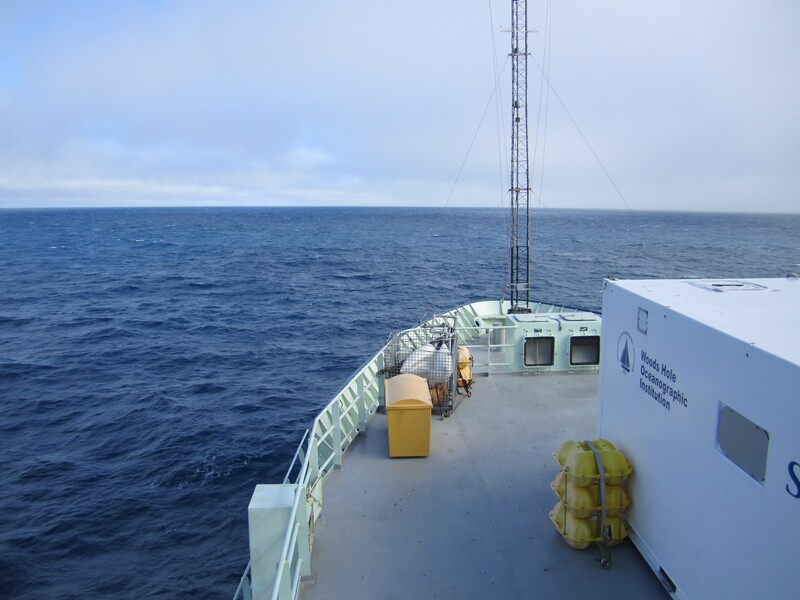 Toward the front of the sub is a basket which holds any equipment that will be used to conduct science experiments during the dive. 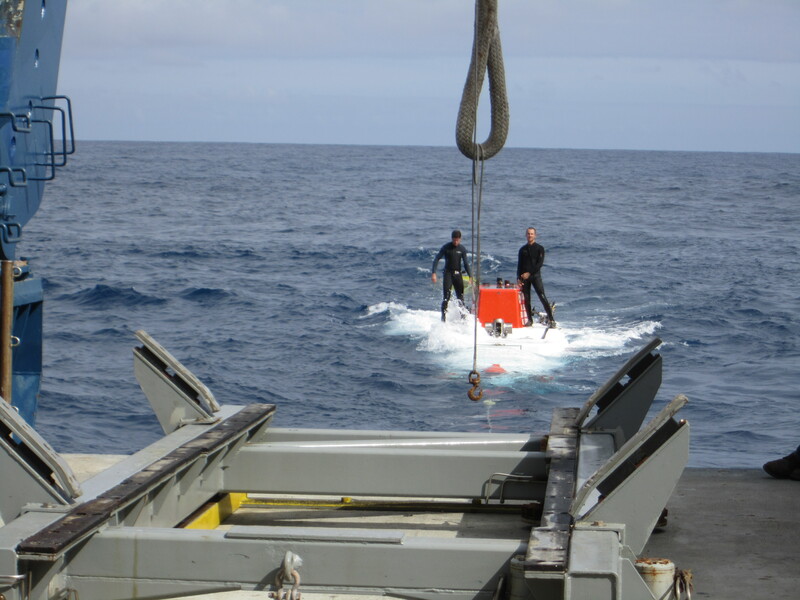 For example, metal cylinders were used on a few of the dives to hold samples of water. On either side of the basket are Alvin’s arms. One fairly new and dexterous, with a miniature version inside for pilot control, and the other much older and better at heavy lifting. Two metal spheres are attached to the sub behind the basket. Mercury is stored in these spheres and can be pumped around the body of the submarine to adjust tilt. The mercury exists as a liquid even in the cold depths of the ocean, and since it’s very heavy, it’s an optimal substance for weight adjustments. There are a total of five portholes, three on Alvin’s face with 17” diameters and two on either side with 12” diameters. Surrounding the crown of Alvin is an array of lights and cameras. Two spherical cameras sit on either side with 360 degree views. Recovering Alvin after a dive. After the walk-around, it was time to go inside. 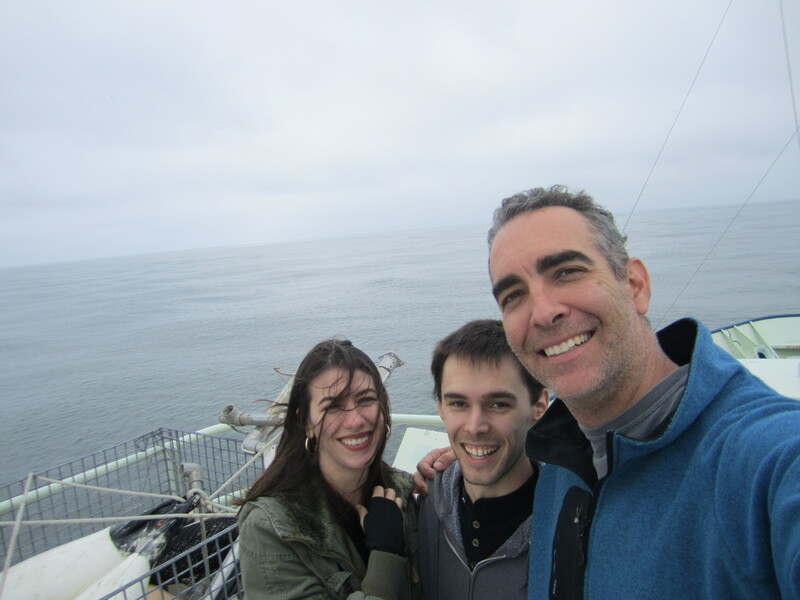 We went up to the second level of the garage and walked on top of the sub to get to the hatch. We took our shoes off and climbed down a ladder into the hole. The room was small and dark, lit by dim red LEDs among numerous controls and switches on all walls of the bowl. The pilot sits on a small stool in the middle and on either side of him are slanted floor spaces for two passengers, one port and one starboard. Directly behind the pilot is a stack of oxygen tanks, three of which are responsible for filling the sub during a normal dive. The rest of the stack is there in case of emergency or delayed recovery. Carbon dioxide scrubbers are neatly tucked on either side, along with EBAs (emergency breathing apparatus), just in case. Both passengers have their own display of video feed from the external cameras on their side of the sub. Along with each display is a hand held controller that allows the passenger to switch between multiple camera views. For instance, the starboard passenger can change the direction of a specific starboard camera (say, camera #1), hit record, then switch channels to a different starboard camera (camera #2) and do the same. 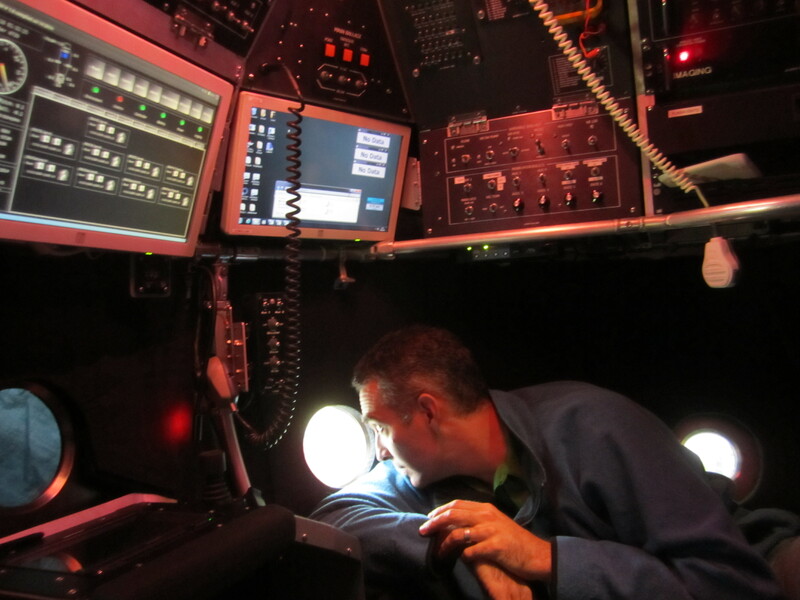 Cody inside the Alvin Submersible during his orientation. Jefferson took his time going over the specifics, things every passenger must know before they dive, in case the pilot needs assistance or suddenly becomes incapacitated. After exiting the sub and undergoing a full orientation, the potential passenger (me!) must sign a form to be eligible for a dive. If you can’t tell already, I was more than eager to sign the form, just in case there was some small sliver of a chance that I may be able to dive. I wasn’t exactly high up on the list, but I was glad to have at least gotten my name on the list! And who knows, maybe I will meet the R/V Atlantis and Alvin again, in the near future, and get a chance to travel to the seafloor. After watching Aliens of the Deep, I’m beginning to think that I could shift my career to test instrumentation in our oceans in preparation for a mission to explore Europa’s oceans. Exploring the unknown, whether on our planet or another, is such a tantalizing notion. I feel a deep desire, an intense willingness, to sink to the bottom of the ocean, my eyes open the entire time, to catch a glimpse of the alien universe that lies beneath. It’s too tempting, for goodness sake, it’s right here! Our own home; no space shuttles necessary.